There has sure been a lot of fear mongering, of late, by the same folks that we’re spinning the facts in the Bu$h administration. The Neo Republican minions of the corporate government still speak with one voice and the choreography is all too predictable. KSM is on trial for his involvement in the destruction of the World Trade Center and the scene of the crime is, of course in NY City. Typically criminals are tried in the jurisdiction where the crime was committed. If anyone has any objection, they should file for a change of venue. That is how the law works, not by a bunch of extremists screaming bloody murder because they don’t get their way. How about some consideration for the folks that lost relatives, shouldn’t they be able to see justice being done? Can it be that there is more to this than the main stream media is reporting, like maybe, that admission of evidence about other possible perpetrators of the crime cold be brought up? That looking closer at the evidence at the scene of the crime might reveal a few things that could reveal that the official government story is not feasible? This is, after-all, the crime of the century and as such deserves a fair trial witnessed by the folks who were affected by this horrible and unbelievable, even after nine years, crime that has touched every one of us. Sen. Lindsey O. Graham (S.C.) said that if President Obama agrees to try alleged Sept. 11 mastermind Khalid Sheik Mohammed and four accused henchmen in military tribunals, he will press fellow Republicans to vote to close the prison at Guantanamo Bay, Cuba. 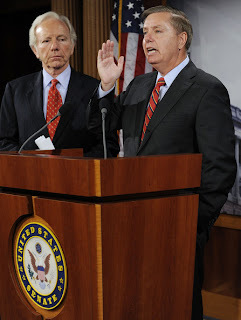 Graham, interviewed Sunday on CBS’s “Face the Nation,” said reversing a plan by Attorney General Eric H. Holder Jr. to try the suspected terrorists in a civilian court in New York would be seen by the public as an act of leadership. The White House is reviewing Holder’s plan, and no new recommendation has been presented to the president. A decision is not expected for several weeks. Beyond Mohammed’s case, Graham also said a new legal framework is needed to deal with the most dangerous detainees at the U.S. military prison. “We need a legal system that gives due process to the detainee but also understands they didn’t rob a liquor store,” he said. Closing Guantanamo Bay was a key promise Obama made when he took office, but it remains unfulfilled as he battles pressure from both sides of the political aisle. In a full-page ad in Sunday’s New York Times, the American Civil Liberties Union said that if Obama does not back Holder, he will be extending the policies of the George W. Bush administration. The ad shows an image of Obama on the left and in subsequent panels moving to the right, the image morphs into a portrayal of Bush, who set up Guantanamo Bay for suspected terrorists. “As president, Barack Obama must decide whether to keep his solemn promise to restore our Constitution and due process, or ignore his vow and continue the Bush-Cheney policies,” the ad states. Barack Obama began his presidency with an open hand toward the man he had just defeated in a race that was at times bitter. “There are few Americans who understand this need for common purpose and common effort better than John McCain,” said Obama at an inauguration-eve tribute dinner to his former foe. But in the year since that evening of comity and collegiality, McCain has emerged as one of the leading critics of the new president. On foreign policy, his traditional area of expertise, and domestic affairs, where McCain has shown new passion, the 72-year-old Arizonan is making it plain that he has no plans to serve out his years in the rank-and-file, as a politician known more for what he lost than what he will yet accomplish. For years, McCain relished being an outsider and a maverick, a style that often led to battles with his own party’s leadership. Today, for reasons that friends and McCain observers say could range from unresolved anger to concern for his right flank as he seeks re-election to genuine dismay about Obama’s agenda, he is helping lead a fiery crusade of GOP loyalists against Democratic priorities – and irked some of his Democratic colleagues in the process. Because of his Senate platform, longtime fame and a relative dearth of high-wattage Republicans, McCain has become something close to an opposition leader in the Obama era: There he is on the Senate floor denouncing Democrats’ health care plans; there he is on “Meet the Press,” offering the GOP response to the administration’s Afghanistan policy; and there he is back down in South Carolina, holding another town hall meeting with Graham as though the race never ended and the Straight Talk Express is still gassed up and ready to go. “The first year has been like an extension of the presidential campaign in many ways,” said John Weaver, formerly one of McCain’s closest advisers. Democrats argue that McCain has marched to the right, pointing to his opposition to Judge Sonia Sotomayor’s nomination to the Supreme Court after years of trying to avoid battles on judicial nominations; his damaging criticism of the Democrats’ climate change plans when he was an early supporter of cap-and-trade legislation; his attacks on AARP when he actively sought the powerful lobby’s support in the 2008 campaign. Democrats are growing increasingly frustrated with the brash political attacks Sen. John McCain has launched against Barack Obama in the weeks since the new president took office. No one expected the Arizona Republican to be a legislative ally for this administration. But it was widely assumed that Obama’s overtures to McCain in the weeks after the election would dull some of the hard feelings between the two. Now, they are realizing, it has not. 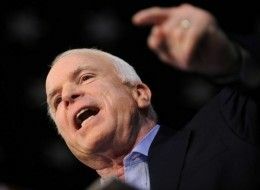 Indeed, during the debate over the economic stimulus package it was McCain, as often as Senate Minority Leader Mitch McConnell, who spearheaded the opposition. The Arizona Republican denounced the proposal as pure pork on the Senate floor and introduced an alternative measure compromised nearly entirely of tax cuts.